A team of Japanese engineers has designed robots that can perform pushups, do crunches, stretch and even sweat while doing so. The robots Kengoro and Kenshiro, described in the journal Science Robotics, can perform remarkably human-like movements—and could serve as a model to help scientists design better crash dummies and prosthetic limbs and to better understand the moving human body's mysterious inner workings. Researchers have been developing humanoid robots for years, each becoming more advanced than the last—but there are still a number of kinks to work out, the study authors wrote. "A limitation of conventional humanoids is that they have been designed on the basis of the theories of conventional engineering, mechanics, electronics and informatics," the study authors pointed out. That's in part because conventional robots are often made of rigid, unforgiving parts, whereas human bodies (aside from their skeletons) are made of more pliant materials, such as skin and muscle and cartilage, giving them greater flexibility and adaptability to an unpredictable environment. Traditional robots, the study authors added, are usually built with a particular application in mind—to help with daily tasks or respond to disasters, for example. "By contrast, our intent is to design a humanoid based on human systems—including the musculoskeletal structure, sensory nervous system, and methods of information processing in the brain—to support science-oriented goals, such as gaining a deeper understanding of the internal mechanisms of humans," the scientists wrote. Such a robot could help researchers better understand how our own bodies really work, by giving them a real-life model to experiment with. "The features crucial for improving humanoids are hidden behind the structure and motion processes of humans," they wrote. "Hence, we incorporated elements that facilitate fidelity with the human musculoskeletal system." 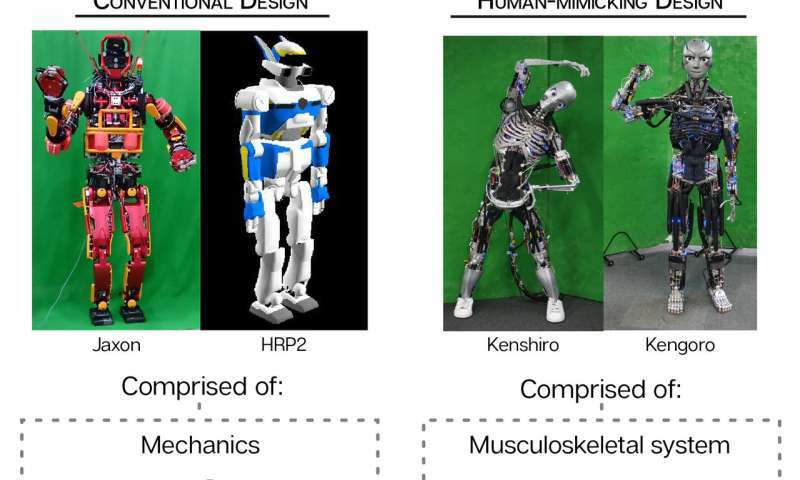 To design Kenshiro and Kengoro, the scientists used human statistical data to give the robots more humanoid proportions, both in their mass distribution and in the size of each body part. They set up the skeletal structure and tendon-driven actuator systems that were meant to echo the connections made by muscles and tendons in the human body. Finally, they tried to design the joints to mimic those in human bodies. Humans have 548 degrees of freedom at their joints, allowing for a remarkable and complex range of movement; if you leave out the face and hands, there are still a whopping 419 degrees of freedom, the authors said. Standard axial-driven humanoid robots, such as ASIMO (known for playing soccer with President Obama) or HRP-2 (which competed in the DARPA Robotics Challenge in Pomona in 2015), have far fewer joint degrees of freedom: around 27 to 55, the study authors wrote. But tendon-driven robots like Kenshiro and Kengoro, with their human-inspired musculoskeletal structures, have about double that, from 55 to 114 joint degrees of freedom. Kenshiro has 64 degrees of freedom, thanks to multiple spine joints (structured in a human-like S-curve) and a more humanoid knee joint. Kengoro has 114 degrees of freedom—or 174, if you include all the joints in its hands. Kengoro does have fingers and toes, but they still have a way to go to match the musculature of human digits, the study authors wrote. Given how important these "end effectors" are to human life, improving those is key, they said. "End effectors are quite important for humans in their daily lives," the researchers said. "This suggests that it is essential to develop human mimetic end effectors to move humanoid robotics forward." The researchers even designed Kengoro to sweat, developing an artificial perspiration system to release heat from the motors. The scientists say incorporating these kinds of humanoid characteristics could help reveal the invisible inner workings of human bodies—and find better ways to prevent and treat illness and injury. "One research group has suggested the possibility that a musculoskeletal humanoid can be used in medicine, such as to grow tissue grafts," the scientists pointed out. "If a humanoid can replicate human movements, then the resulting muscle contribution analysis or sensory data obtained during motion will benefit athletes or sports trainers." That kind of data could also be useful for developing better artificial limbs or designing tele-operated human agents, they added. It could even make crash dummies more "active" participants in experiments, incorporating the ways that human bodies react during accidents and making those tests far more accurate. "An interesting application is active crash test dummies used during car crash testing, because current dummies can only measure passive behavior," the study authors wrote. "A human mimetic humanoid enables the replication of human reflective behavior by muscle actuation."